Figure 2.H Average boundaries of sea ice (coverage at least five- to eight-tenths) in autumn and spring in the Arctic. Arrows indicate the general drift pattern. 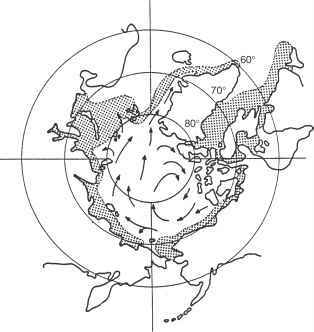 The width of the stippled area indicates the range of ice limits between autumn and spring (Untersteiner, 1966). of acoustic frequency, geometry and the statistical (spatial correlation) properties of the under-ice surface. The sea floor is a reflecting and scattering boundary having a number of characteristics similar in nature to those of the sea surface. Its effects, however, are more complicated than those of the sea surface because of its diverse and multilayered composition. Specifically, the sea floor is often layered, with a density and sound speed that may change gradually or abruptly with depth or even over short ranges. Furthermore, the sea floor is more variable in its acoustic properties since its composition may vary from hard rock to soft mud. 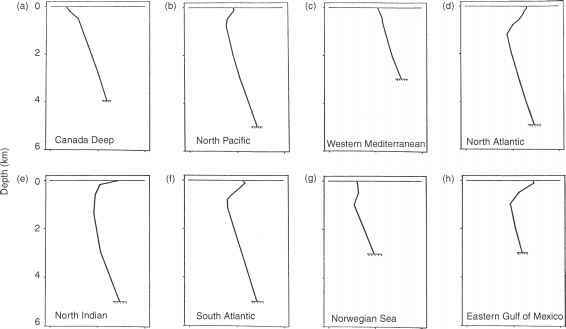 One feature that is distinct from the sea surface is that the bottom characteristics can be considered to be constant over time, whereas the configuration of the sea surface is statistically in a state of change as the wind velocity changes.